SASP have a dedicated Primary PE Specialist Team committed to providing advice and support to primary schools across Somerset. National Governing Bodies of Sport (NGBs) are keen to work with and support Primary schools make the most of the new School Sport Premium. NGBs will support any schools which want and require help in maximising the investment or accessing services to help them improve the quality and quantity of physical education and school sport. Clear and simple 'offers' have been developed which set out why each sport wants to support Physical Education in Primary Schools; what the benefits are for primary schools to work with each NGB and what each sport's offer consists of. Please click on the links below to access each offer. Balance Buddies is a fun, active educational package designed to aid the teaching and assessment of early years learning, using balance bikes and planned activities. Many primary schools are already enjoying Balance Buddies having used their PE and Sport Premium funding. Our packages come with all resources needed to run fun sessions; Kiddimoto bikes, helmets, Highway Code road signs and cones. It's a ready-to-use resource aimed at getting kids active and learning while developing the life-long skill of riding a bike. Wherever you are, let us know what you're after and we can create a bespoke package for your setting. We are here for your next adventure! At Channel Adventure, we make it our mission to share our love for the outdoors with you. We are a team of highly experienced trainers, who have a genuine passion for what we do. We offer a wide range of adventurous activities, for all ages and from all walks of life. Our sessions range from Kayaking to Tree Climbing. We run safe, fun activities using high quality equipment; all instructed by qualified experienced staff at brilliant venues - whether its on the river or on the coast! Complete PE is a web based interactive P.E. resource for EYFS, KS1 & KS2, written by practising PE specialist primary teachers. * it contains c.5,000 bespoke filmed video clips of Age Related success outcomes at all Key stages across the PE curriculum; both creating the complete solution for Planning, Delivery, Assessment, and making the resource a sustainable CPD tool, with annual updates. * it is written as a Sequence of Learning from EY to upper KS2, that focusses as much on skill development as cognitive understanding, thereby deepening the learning experience. Get Set 4 PE is an online portal, written and designed by teachers for teachers. The portal contains lesson plans, schemes of work, assessment, curriculum mapping and resources for pupils from EYFS through to KS2. The activities cover the whole curriculum from gymnastics, dance and yoga to the more traditional games such as hockey, tag rugby, and tennis. The portal has been designed to help to save teachers time on planning and assessment whilst providing staff with the confidence to deliver high quality PE. All lesson plans and resources are printable and there are music and videos to support teaching. We are a world-renowned company founded in 2011, we have won many international honours and travel all over the world teaching and demonstrating the sport of jump rope. Due to our success we started a company of coaches who teach and inspire children to take up jump rope. We visit schools all over the UK running PE lessons and all-day workshop; also helping to set up new teams to participate in their school competitions, national competitions and festivals. Our new project is our online resources; where teachers can utilise our lesson plans and videos to run their own jump rope PE lessons. PH Sports have been working in primary schools for over 10 years delivering high quality, engaging PE lessons alongside numerous extra-curricular clubs (breakfast, lunch and after school). Over the past decade, we have established ourselves as the leading provider of PE and School Sport across Wiltshire and are looking to now spread our expertise further across the south-west into Somerset and Dorset. Our lessons are innovative and aim to engage every child throughout every lesson. PH Sports have developed a teacher CPD programme that can be delivered in different ways to suit every teacher's needs. We have also recently introduced a mentoring programme for pupils. River Bear Yoga brings holistic well-being to children through yoga, play and mindfulness. It is our belief that every child deserves to feel well in both body and mind and our aim is to equip them with tools to make it so. To bring our mission to fruition we have created the River Bear Yoga and Well-being training programme for teachers and educators. Empowering and up skilling teachers to deliver children's yoga and mindfulness into the classroom. Our hope is that yoga, play and mindfulness becomes an integral part of each school day in primary schools all over the UK. Saints Southwest is an official club partner of Southampton Football Club to support the development of the programme, in order to benefit from the expertise and experience of one of the world's leading player development programmes in World football. Saints Southwest operate in Cornwall, Devon, Somerset and Dorset. Whether you are a school looking to improve your Physical Education/Extra Curricular provision, or a young person looking for opportunities to learn/develop in sport we have something for you. We pride ourselves on being able to reach all children through various Education Community and Football Development programmes, helping nurture and develop players to become the best they can be on and off the pitch. Super Movers, a campaign from BBC Learning and the Premier League to get primary aged children active. 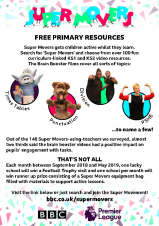 FREE PRIMARY RESOURCES - Super Movers gets children active whilst they learn. Search for 'Super Movers' and choose from over 100 fun curriculum-linked KS1 and KS2 video resources. - PECs, a PE and Sport mentoring program for teachers fully endorsed by afPE and providing data for all to use. This programs mentors' teachers to assist them in delivering HQ PE sessions. - MOTM, a Maths program (MoTM) where we deliver tailor made packages to all ages and abilities covering the whole NC Maths course. - PPA, out bespoke program which is driven by the school to ensure it is it for purpose.